I’ve been leaning away from my heavy foundations recently, maybe due to my skin being a bit rubbish and I mentally can’t tolerate feeling makeup on my skin, or maybe my brain is in summer mode. Who knows. Either way, lighter bases have been working their way into my daily makeup bag so I thought I’d share my top picks for your-skin-but-better makeup. Starting with the most coverage, Estee Lauder Double Wear Light is the lighter version of my all time favourite foundation and one I’ve been wearing pretty much non-stop for the past week. You can still get up to medium coverage from this, which is pretty darn good, but it just feels so much lighter on the skin. It has the same staying power as the original double wear too, so it’s perfect if you’ve got a long day ahead. 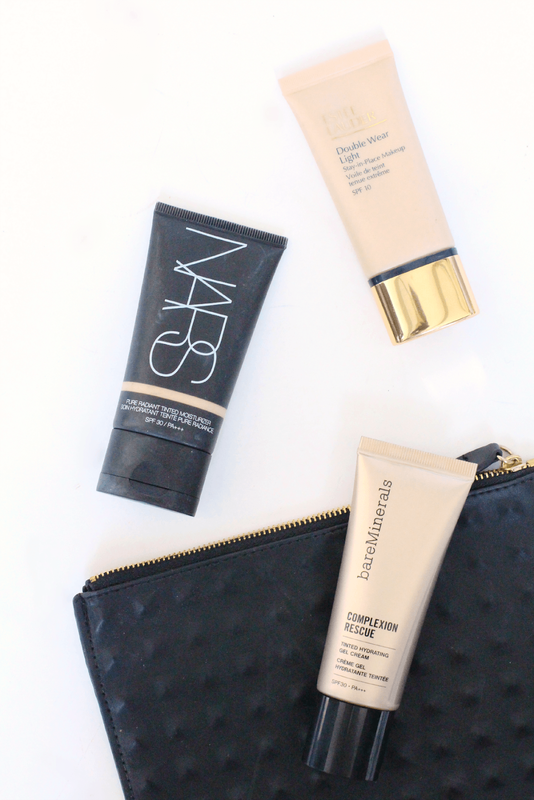 Slightly less coverage is another favourite, the wonderful NARS Pure Radiant Tinted Moisturiser. I love this for days when I don’t want to wear a full face of makeup, but I still want something to even out my skin. You can build this up to move coverage, but it’s definitely under medium. The radiant side of it is always appreciated as it really does make skin glow! The lightest of them all is the new Bare Minerals Complexion Rescue, which they refer to as a ‘tinted hydrating gel cream’ which I think is spot on. It’s like a moisturiser with a little somethin’ added to it to even out your complexion, add a bit of a healthy glow and hydrate your skin. Definitely one for this with normal-dry skin who like a super light base! What light bases you you love to use? Remember you can win the rose gold GHD styler and hairdryer in my latest giveaway! Have you read The New York Girl;s or Alexandra Elizabeth‘s blog yet?